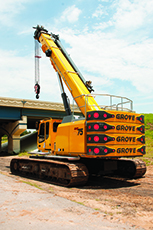 Grove is one of the world’s leading producers of mobile hydraulic cranes. 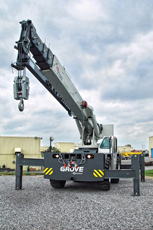 Grove’s Rough Terrain Product Line features unique, innovative technologies such as TWINLOCK boom pinning system and the MEGAFORM boom design – designed to optimize both vertical and lateral strength. Equipped with four steering modes and easy maneuverability, Grove RTs are designed to handle tough conditions on job sites. Since 1925, Manitowoc Lattice Boom Crawler Cranes have built a strong reputation based on reliability, high performance and build quality. Many of the available Manitowoc Crawler Cranes offer industry leading features, such as EPIC controls and FACT quick-assembly system. Grove YardBoss Industrial Cranes are known for their ease-of-use, compact dimensions and mobility in tight quarters. Great for maintenance and material handling jobs, YardBoss Cranes feature carry decks, dual fuel options and multimode steering. The GHC Series telescoping crawler cranes are redefining industry standards. The GHC Series combines excellent gradeability and lift capacity with 100 percent pick and carry capability. It all comes in a package that’s engineered for exceptional operator ergonomics and maneuverability, thanks to its rugged, heavy-duty crawler tracks and telescoping boom. Due to their unrivaled reputation of dependability and durability, National Boom Trucks have been used by various industries for decades. National Boom Trucks offer an easy solution for a rigorous job site schedule. The Potain Self Erecting Crane product line is made up of the Igo, Igo MA, Igo T and HDT series. 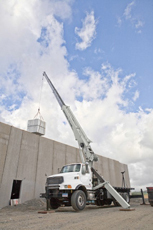 Self Erecting Cranes are known for their quick and easy set up, installation and transportation. 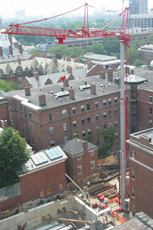 Potain cranes are compact and offer strong productivity and precision using a small foot print. 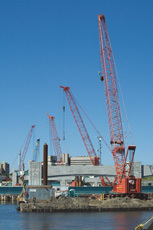 Potain cranes are ideal for short term projects or crowded job sites. Terex TM Hi-Ranger Tracked Material Handling Buckets offer a variety of specialized options to adapt to different types of jobsites. 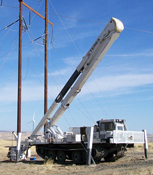 The equipment provides 168° of upper boom articulation and 90° of lower boom articulation. The innovative design enables long reach with a platform capacity of up to 800 lbs. The machines are mounted on a Prinoth Go-Tract carriers featuring a carefully developed sprocket-track system allowing for strong performance on all different terrains. The Terex General Series tracked Digger Derricks offer 100° of boom travel (+80 to -20) with dual lift cylinders. The General series ranges from 65 ft sheave height to 95 ft sheave height. The machine is equipped with full pressure hydraulic controls, open-center hydraulic system and continuous unrestricted rotation. The machines are mounted on a Prinoth Go-Tract carriers featuring a carefully developed sprocket-track system allowing for strong performance on all different terrains. 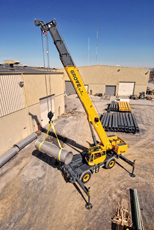 Tracked National Cranes range from 30 to 45 US ton with tip heights between 163 ft and 203 ft. National Crane offers durable equipment built for rigorous work schedules. The pilot operated hydraulic controllers allow for easy operation, the all steel crane cab with graphical LMI system is well insulated and grants high visibility and three position outriggers allow for a strong load chart. Gravity hung personnel baskets are available with cylinder brake lock for easy maneuverability and strong reach. The machines are mounted on a Prinoth Go-Tract carriers featuring a carefully developed sprocket-track system allowing for strong performance on all different terrains. Morooka Rubber Track Carriers offer strong load capacities and traction, allowing you to travel on an assortment of different terrains, ranging in size from 5,000 lbs capacity to 33,100 lbs capacity. Morooka Rubber Track Carriers are equipped with hydrostatic transmission, allowing economical use of the engine’s full power, and user friendly single-hand control levers. The Morooka carriers are equipped with rubber tracks that combine the characteristics of a tire equipped vehicle, such as speed and a smooth ride, while providing the traction of a steel track. The rubber tracks also allow for low ground pressure, high performance movement and excellent traction.